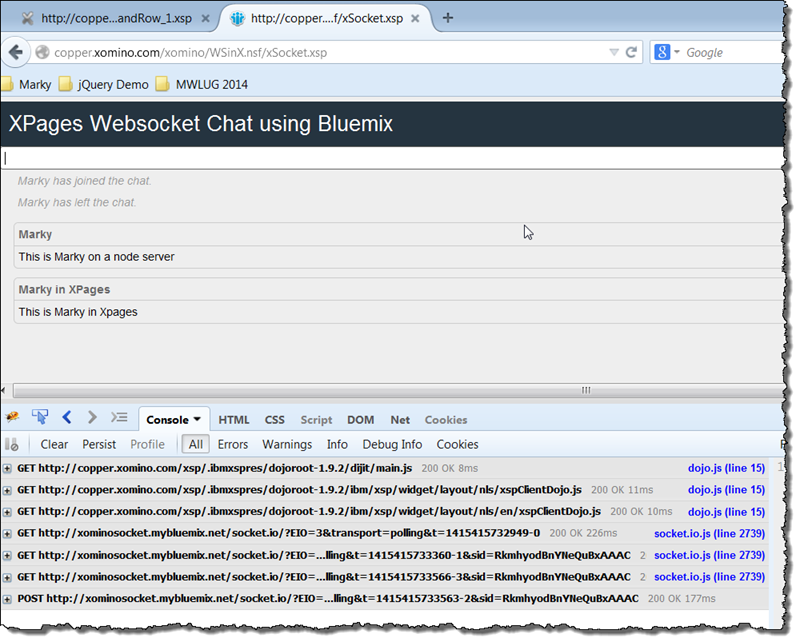 In this article I will demonstrate how I was able to take an example Bluemix, node.js based, websocket chat program and re-purpose it to be used in XPages. 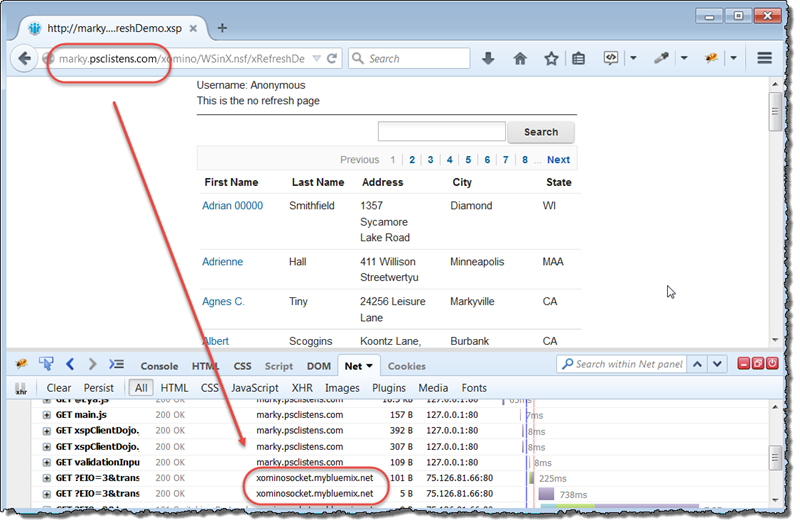 Earlier this year I was very excited to find the Websockets in XPages project on OpenNTF published by Mark Ambler. The concept behind that project is to be able to create a notes document in a queue which is processed and then send out to all users. As much as I promised to help out and use the project, life and a business need to learn and use Angular.js got in the way. My abject apologies to Mark for not following through on my promise to help move the project along. 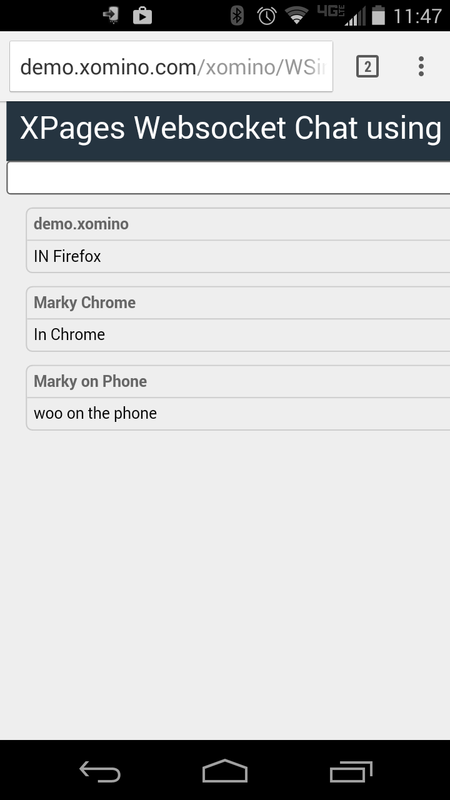 I found this article on Create an HTML5 chat app on Bluemix with Node.js, Redis, and Socket.io and following it through I was able to get my own chat program up and running within an hour or so. It is not an especially difficult example to follow but I did find that it helped to understand a little about Bluemix and how a node.js application is put together. You should be able to figure it out though just following through the example. The code for the original example can be found here https://hub.jazz.net/project/joelennon/bluemixchat/overview?welcome= if you want to take a look at it. 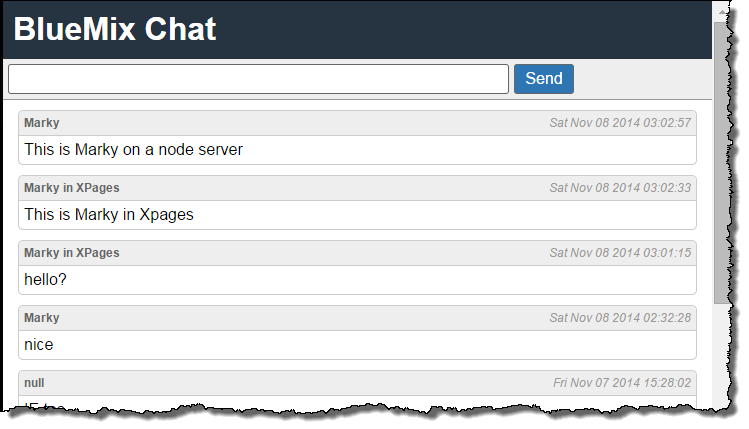 Within the original example, the interface makes a connection to a Redis database to store the last 99 entries of the chat. Within the XPages example I could do that but I am not going to at this time. So the XPages interface will lose chat history when you refresh the page. I am not really concerned about that in the big picture. Because I had all the files locally I was able to create a new IBM Domino database and drag the files into the WebContent directory. Within node.js the “Public” directory is assigned to the root of the server, but in this case I removed the public folder as it is unnecessary. The original example uses the jade templating engine to create the web page. But in this case I felt lazy and just viewed the source of the example once it was working and then extracted all the HTML I needed. The HTML of the XPage is relatively simple. As you can see below we a using the xp:resources tag to insert the same HTML references to the local files as they were in the original example. Within the original example the socket code was on the same server as the client creating the messages. In this case they are not as my XPages server is wholly independent of Bluemix. With these changes and a couple of stupid spelling mistake corrections I was able to bring my application up within my xSocket XPage. There is a lot more detail which we can go into as to how this example works but in the mean time if you want to play with it. You can find my Bluemix code on Jazz Hub – https://hub.jazz.net/project/mdroden/xominosocket/overview. In this article I will introduce and discuss the OpenNTF WebSockets OSGI plugin by Mark Ambler. 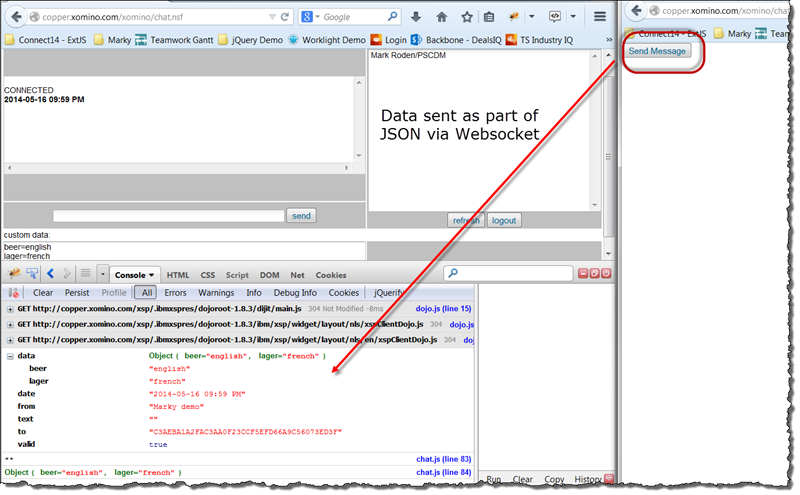 The websocket plugin posted to Mark Ambler is based on the http://java-websocket.org/ project. 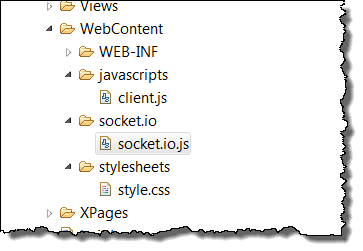 I already wrote about the reasons for websockets in XPages. 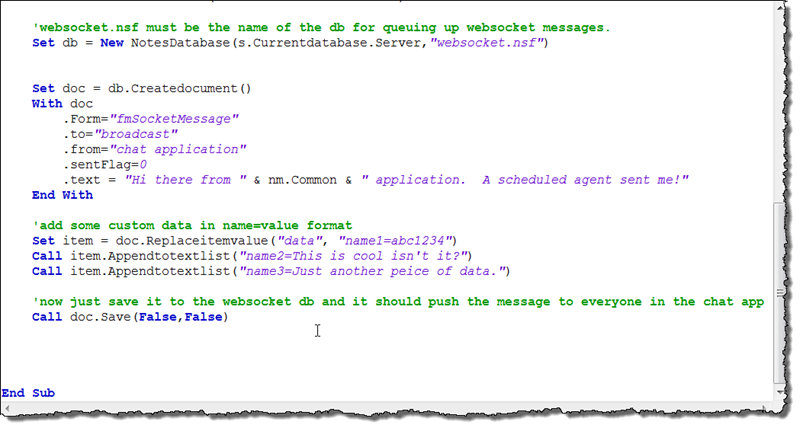 But to recap, WebSockets allows me the developer to PUSH messages out to logged in users without them asking for it. This reduces network traffic and creates a new paradigm for fluid data update. What I will be doing over the next few blog posts is demonstrate examples of why WebSockets fundamentally changes how we architect our web apps in the future. Yes it is that significant in my mind. How does the Domino integration work? Download the OpenNTF project, unzip and follow the instructions in the PDF file. Understand that this is not port 80….this is demonstration right now and not production ready. From a Domino perspective, The core of the application is the websocket.nsf database. In there if you look at the Broadcast Example Agent you will see how it works. By creating a document in the database with the appropriate fields, the websocket OSGI code picks up the document from the view and routes it out to the users. 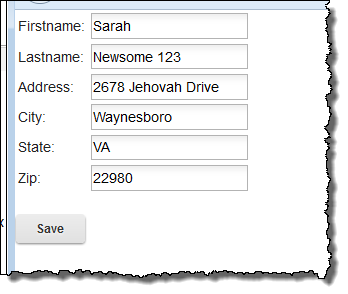 The websocket.nsf database tracks users in the vUsers view and from there we can ascertain the unique code assigned to each logged in user. Using that websocketID listed in the view we are able to ensure that the appropriate message is transmitted to the appropriate user. To extend this into something I can use I create an SSJS function which will look up the socketID – in this case I do not need to know the ID – just the username. I can then call this function from an XPages button (or anywhere else for that matter) and pass in the data as an object. Because there are two servers running (domino and websocket) the websockets are current running over a non-standard port. I believe IHS can be used as a proxy to fix that. As a proof of concept though and to get the information out to the community and IBM (hint hint) this is a great step forward in capabilities. This is a great example of using and OSGI plugin and the Java code in Domino to access a Java server and transmit data – very cool ! We can have any application with an appropriate update, review the users who are logged in and update their web page with the appropriate data. You know a project is moving along when this blog post was already out of date by the time I am ready to post it – but rather than waste it because there is good information in here – here’s the disclaimer. This post is based on v1.0.7 of the webshell code release – as of v1.0.8 the JSON data is being passed via rich text which allows for pre-formatting server-side before sending it out. This also allows for more complex JSON creation than multi-value text fields can handle – thanks Mark – more about that soon !! If you want to see this improve and progress – get involve – play with the code and make requests for changes – like everything OpenNTF – the more you play with it and the more people are involved – the better it will become !